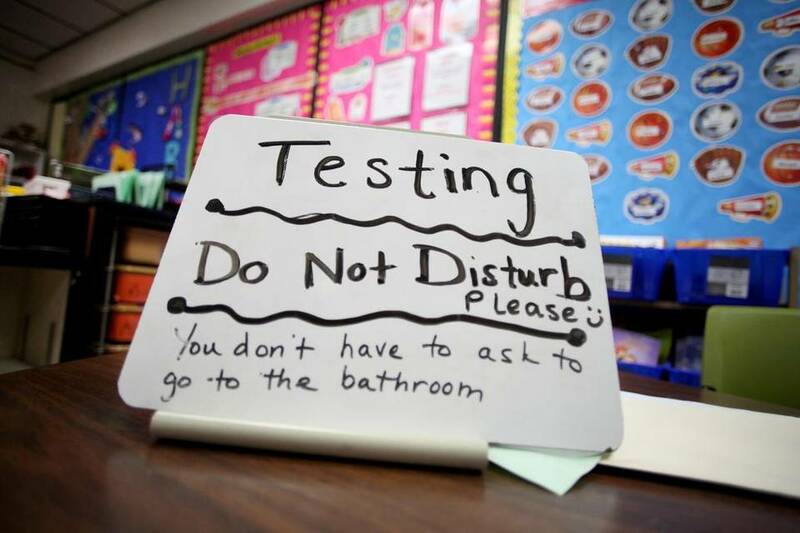 A report on student testing released Thursday finds big gaps in most states between the percentage of students shown to be proficient in reading and math on state tests and the much lower number found to be proficient on a national benchmark test. Georgia, Texas and South Carolina and dozens of other states showed significant gaps between their state tests in the 2013-14 school year and the results of the National Assessment of Educational Progress on tests of reading and math in fourth and eighth grades. The picture is expected to change in upcoming years because many states have raised their academic standards and started using new tests to measure them this year. Results will be available in many states in the fall. “Too many states are not leveling with students or parents. They’re being told students are proficient, but by external benchmarks they’re not prepared at all,” said Michael Cohen, the president of Achieve, the education reform group that conducted the survey. Cohen added that improvements are expected with the new tests. Achieve helped the National Governors Association and the Council of Chief State School Officers develop the Common Core, the standards that define what students should know and be able to do in math and English in each grade. Georgia, for example, began its new Georgia Milestone tests this year. The state had some of the biggest gaps that Achieve found on last year’s tests: 60 percent more scoring proficient in fourth-grade reading on the state test than on national assessment; a 43 percent gap on fourth-grade math; a 65 percent gap on eighth-grade reading; and a 53 percent gap on eighth-grade math. How accurate is student testing? While states administer their own standardized tests for elementary students, fourth graders and eighth graders across the country take the same tests as a part of the National Assessment of Educational Progress. Below you can see which states’ own tests return the scores most closely matching the national tests, and which had the biggest gap. Only Nevada fell in both categories — accurately rating eight grade math, but off by more than 40 percentage points for fourth grade reading. The report also found some states had a narrow gap. For example, in eighth-grade math, 14 states showed their state proficiency levels differed from the national assessment by 15 percentage points or fewer. Two states had higher scores on their state tests than on the national benchmark test: New York, 10 points higher, and Massachusetts, 3. The others, which had higher state scores by 15 percentage points or fewer, were Utah, Michigan, North Carolina, Wisconsin, Nevada, Alabama, Colorado, Minnesota, Wyoming, Washington, Kentucky and West Virginia. The National Assessment of Educational Progress, sometimes known as the “nation’s report card,” is the only consistently used national measure of all students. It is given every other year to a sample population. “My hope is we will see closing of the gap, if you will, the next time states report their results and NAEP reports its results,” said Tennessee Gov. Bill Haslam, a Republican, who participated in the briefing. “This is a time to stay the course even in the face of political pressures we know are out there,” he said, a reference to social conservatives’ opposition to the Common Core. Opponents view the new standards as an example of federal overreach. They were developed by state governors and school officials, but the Education Department encouraged states to adopt them by making higher standards part of the qualifications for competitive grants.